We started our online blog, knowing how to create blogs and what to do to start a blog.We have a blog that allows us to link our website to another link, but we do not want to make any changes to your blog's name or change it. How to change the address, title and description of the blog? Login to your Blogger account and go to the dashboard of your blog. Now you have to go to Settings >> Basic of your blog. Here you will see all these options. 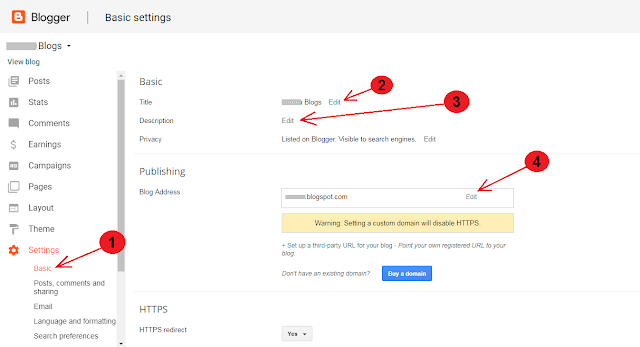 To change the title of your blog, first click edit in front of the title option and now you can change your title. Click to change the description. In the description you have to tell about your blog and it is also very important for search engines.When someone searches the blog on Google, it looks like this description. It is also very important for the SEO. To change the blog address, click on edit in front of it and save your new address. What is Blogging and How To Start Your Blog ? Many Killing Facts. Best free movie download 3 most Sites..
Latest technology Mobile,Who is Unseen....? Reliance Jiao Company joined hands with another company.